Price is per 16-inch strand of these beautiful beads. Largest in the strand measures about 15mm x 12mm x 4mm, although many are smaller - about 52 beads to the strand. Mystery surrounds moonstone. In India it’s considered sacred to lovers, and is also known as a “dream stone?bringing beautiful dreams. 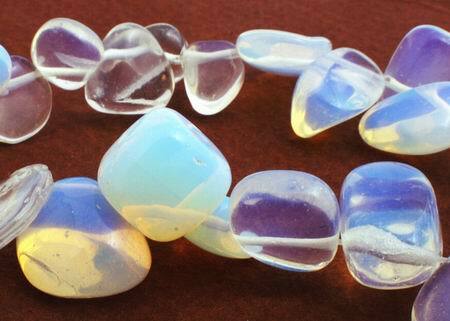 In Arab countries women sometimes wear moonstone as a symbol of fertility. It was also believed to be especially protective to seafarers, who have used it since ancient times. During full-moon, moonstone is very powerful for reconciling love - and as the moon decreases, is said to allow one to foretell the future.